Gram Chetna Kendra (GCK) is operational in Khedi Village of Jaipur district and was formed under the guidance of Mr Om Prakash Sharma in 1989 for holistic development of the area under its operation.The area of operation covers 458 villages in Jaipur, Tonk & Nagaur districts of Rajasthan. GCK undertakes various initiatives in collaboration with foundations and agencies such as Give India, Government of Rajasthan, Lilianne Fonds, and UNICEF to address issues relating to child health and protection, women empowerment, education, sanitation etc. GKC’s excellent rapport with official government bodies and various national and international NGOs helps ensure development and sustainability for the programmes undertaken. GCK functions as a service and awareness centre and encourages localities to participate in the development process through formation of Community Based Organisations (CBOs), Self Help Groups (SHGs) and Panchayati Raj Institutions (PRIs). Before GCK began its work, the area lacked socio economic development. A majority of the deprived were suppressed by the money and muscle power used by a small group of people. GCK’s mission has been to create awareness among the rural masses through democratic means, to empower and encourage them in gaining control over the factors affecting their individual life and the community at large. Foreign Sources: GCK has managed to source funds in the range of 67% to 75% of income during FY10-FY13 from foreign agencies such as Child Fund India, the Embassy of Japan, and Liliane Fonds. Contribution through these agencies in FY13 was Rs9mn (67%). 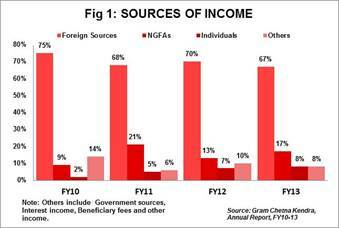 Other Sources: Non Government Funding Agencies (NGFA) contributed 17% (Rs2.3mn) of total income in FY13. A small portion amounting to 3% (Rs0.4mn) was contributed by Government of Rajasthan and Government of India. Individual donations including donations from Give India accounted for 8% (Rs1mn) of total income in FY13. Grants: Grant received in advance in FY13 to the tune of Rs6mn has been deducted from income and would be added back in FY14. 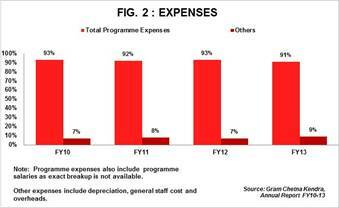 Similarly, unutilised grant of FY12 amounting to Rs1mn has been added to income in FY13. GCK accounts for grants receivable on accrual basis. Hence, grants accrued for the year are added to the income. The same if not received in the following year are reduced from income. All these grants have been adjusted against respective sources of income. Assets: Rs8.3mn or 57% of total assets constitute cash and bank balance representing a portion of donations received during the year deposited in banks. Fixed Assets constituted 24% (Rs3.5mn) of total assets followed by investments of Rs2.3mn (16%). Immovable assets comprise of Land and Buildings (used for the purpose of office, Balwadis and Training Centre) and constitute 56% (Rs1.9mn) of total Fixed Assets in FY13. Trust Corpus: A marginal amount of 3% (Rs0.4mn) of total funds in FY13 is set aside as Corpus and invested in Fixed Assets. Property Funds: Reserves set aside for investment in buildings are termed as Property Funds and account for 16% (Rs2.4mn) of total funds. Unutilized Grants: Grants received in advance and unutilised during the year are reflected in the Balance Sheet under Unutilised Grants and accounted for 43% (Rs6.3mn) in FY13. Income Growth Rate: GCK posted total income of Rs13mn in FY13 recording growth of 10% Y-o-Y. Self-sufficiency ratio: GCK’s self-sufficiency ratio was 13% in FY13. The ratio measures ability of an organisation to meet expenses out of its own funds which includes individual donations, beneficiary fees and other income. The ratio is low on account of small proportion of funds contributed through these sources (13% of total income). Loans: GCK had borrowed funds in previous years to meet a shortfall of funds. However, the loan liability has shown a decreasing trend over the period FY10-FY13. With a loan of Rs0.1m (accounting for 2% total funds in FY12) having been fully repaid in FY13, GCK currently has no debt. Reserves for Contingencies: GCK has set aside funds in reserves to support the communities in times of emergency such as drought, floods and fire. Water shortage: Irregular rainfall has adversely affected agriculture in the region. Water scarcity and agricultural unproductivity has resulted in lot of problems for the farmers. Lack of government institutes: Non-availability of government institutes for imparting educational and vocational training forces the village children to travel far off places. Lack of livelihood opportunities: Lack of employment opportunities in the area of GCK’s operation has resulted in the village population migrating to other places. The Board of Trustees comprise of people from diverse background including doctors, CAs, Social Workers and Development Professionals. The Board meets four times a year to discuss the functioning of the organisation. GCK is accredited by Credibility Alliance for transparency and accountability. It is also listed with Give India. GCK has also published books such as Anmol Pal (on safe motherhood) and Chulo Aasma (on adolescent health).